Thank you MiraInk and Netgalley for this review copy! This book is a 100% feel good book. Perfect for a Spring or Summer day reading. Pippa has moved back to the village she grew up in and reconnecting with her youth. Pippa is a go getter and doesn’t want to see her old dance teach Miss Mimi fall under the pressure of the dance school which has just gotten too much for her. Pippa as a character is lovely. She is a divorcee who is a little worried about her weight gain after the divorce but overall she doesn’t let this get between her and her life. She gets back into the community and reconnects with an old childhood friend and Tom, a childhood crush which just hasn’t gone away. She is a cheery character but is vulnerable making the reader draw into her life and feel what she feels. Tom has had his fair share of troubles working in the village. A partnership gone wrong has left the village mistrustful and surly. This leaves Tom rather downbeat and along with his daughter Lucy he tries to rekindle to bond between himself and his daughter and Pippa who has just moved back. Struggling to get along with his daughter he throws himself into helping the one thing she loves, dancing. Tom as a character is negative in places but has the ability to love deeply as is shown with his daughter. Being the inevitable love interest Fiona has made sure that the reader starts to root for him. We want to see him win. The only negative in the book would be the pacing at the start as it took a while to establish the characters and their situations, but once that was past it was totally. This story is full of fulfilment and a drive to succeed through what is thrown the way of Pippa and her gang of tap dancers. These challenges and time constraints add an element of impending doom into the plot, and where not everything turns up as they hoped there is always a silver lining to all that happens. 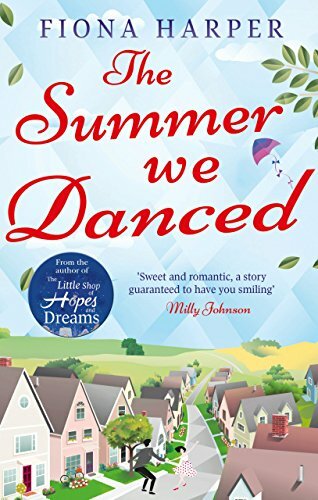 I really enjoyed this book and felt for Pippa as she tried to rekindle Miss Mimi’s spirit for her dance school in time for the 50th anniversary concert. This uplifting book put me in a good mood as I read it and the finish was satisfying for the reader and made for a great read!